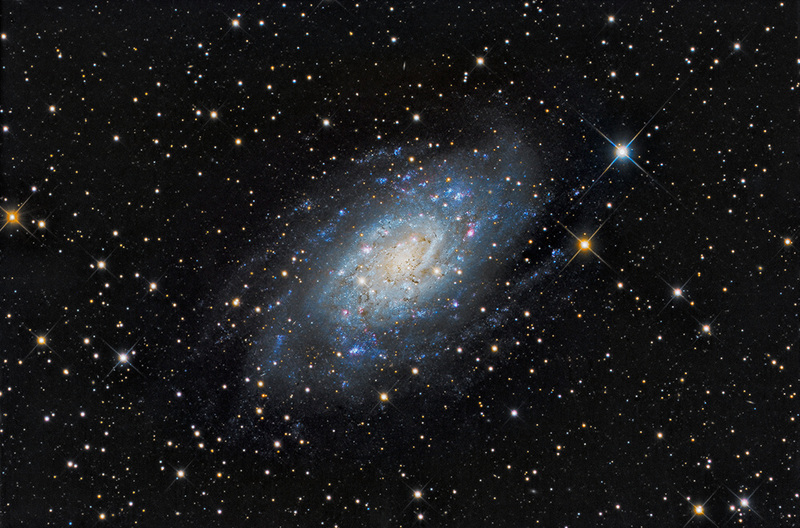 is an Sc-type spiral galaxy in a constellation named for a Giraffe! Discovered by William Herschel in 1788, it is an outlying member of the M81 Group at approximately 10,000,000 light-years distance from Earth. Many star-forming regions can be seen as the bright pink emission nebulae within the blue-green spiral arms. Edwin Hubble used 2403 in the observations resulting in Hubble's Law. Training the Hale telescope on it, Allan Sandage detected the first Cepheid Variables beyond our Local Group. At half the mass of our own Milky Way Galaxy, evidence of young stars in the halo hint at a recent merger with another galaxy. As recently as 2004, two supernovae were reported. I am once again grateful to David Plesko for the wonderful data. See Tammy Plotner's excellent write-up at Universe Today.